Vocal Lab helps you train to sing on key. It listens while you sing and displays the pitch of your voice on a graph, in real time. All you have to do is watch the graph while you sing and try to stay near the lines. With a little practice you can greatly improve your intonation. Vocal Lab can identify problem areas in your singing, and can also help improve your intonation on various instruments - Violin, Brass, and Woodwinds. Laidman & Katsura thank you for your interest in our products. We have an entire line of tuning products, and we hope that one will suit your needs. Sing or play a note and hold it. The tracking indicator should advance steadily while you hold the note. The tracking indicator advances one (very small) unit every time a successful pitch determination is made. A smooth procession indicates great success. Now you're ready to begin. Your results should be nothing short of spectacular! If you're having trouble or feel your results are less than ideal, please read the sections entitled, 'Selecting the Microphone', and 'Best Results'. Microphone placement is very important for Vocal Lab. This topic is covered in 'Best Results'. Place the microphone near you, or position yourself near the microphone. The microphone should generally be located as near to the sound source as possible. However, singing too close too a microphone may create "popping" effects. A good starting point is about 2 feet distance. A little experimentation may improve results. Avoid handling the microphone because it introduces rattling noises. If you have an external microphone, try making contact between the microphone and instrument. For example, when singing, hold the microphone to your neck, near the vocal chords. Instead of using the internal Microphone on your Macintosh, you may use an external microphone connected to your computer's Audio line in port. (Better results will usually be attained by using an external microphone.) If your computer does not have an internal microphone or Audio line in port, you can purchase a low-cost third party device such as the iMic USB Audio system. Connecting an electronic instrument directly to the Audio line in port will achieve better results than using a microphone because 'ambient' noise is eliminated. Typical instruments that you might connect are Electronic Keyboard and Guitar. You may need a cable adaptor to make this connection. Use either Line output or Headphone output of your instrument. If your electronic instrument or external microphone produces a very low signal, such as an unamplified electric guitar or external microphone, you can use the iMic USB audio system as a 'pre-amp'. Whenever you connect an electronic instrument to your computer, be sure to set the output level (volume) appropriately. Begin with the volume level of the instrument turned all the way down, then turn it up slowly while watching the level indicator in the Sound Input control panel. With the input level slider all the way to the right in the Sound Input Control panel, the volume level of your instrument should just peak the meter. CAUTION: Never use an electronic device that exceeds 'line level' which is a standard for audio equipment. 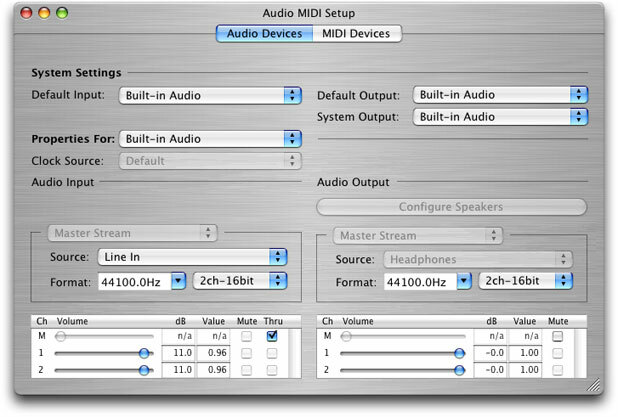 Advanced Users may find additional configuration items using the Audio-Midi Setup Utility included with your Mac. Here you may choose the 'Thru' item to monitor the input device through speakers or headphones. The horizontal lines across the graph are placed at the 12 chromatic tones. The "register" of the note (which octave it is in) is ignored; all notes wrap around to the 12 notes of the display. The objective is to stay as near to these lines as possible, while you sing or play. The further you stray from the lines, the more out of tune you are. This plot shows in great detail the pitch history and helps isolate problem areas in your intonation. For example, you may tend to start flat and glide up to the note, or you may drift flat as you hold a note. Nobody can sing "perfectly" in tune such that they always stay on the lines, but, that is the objective. Some people may have a hard time accepting that they are really that much out of tune, but the graph does not lie! Click the button to choose an octave for the audible reference tone, if desired. The reference tone may not be audible if you set it too high or too low. Note: The typical reference pitch is A4 = 440Hz (Note A, Octave 4). These standard indicators - Volume, Fine Tune, and Tracking are essential for operation. You should monitor them occasionally to see that conditions are right for pitch detection. The Volume indicator shows the input signal level. The Tracking indicator advances a small amount for every successful determination. The fine tune indicator shows the result, in terms of deviation from ideal frequency. Each pixel of this display represents one cent, which equals 1/100 of a semitone. This is an extremely fine scale, and it is impossible to hold a note with your voice exactly at the center of this meter. 10 pixels either direction of center is excellent! Pitch Smoothing averages the input pitch over time. The trace of the graph will have a smooth connected appearance, as opposed to scattered dots. However, the trace may 'glissando' through frequencies that were not actually present in the input. (This is the nature of "averaging".) We suggest that you select Full pitch smoothing, unless you specifically do not want to smooth the display. How large the dot that makes the trace, use in conjunction with Trace Speed. The horizontal spacing between dots, use in conjunction with Dot Size. The effect of this setting is to control how fast the trace moves across the screen. In One-shot mode, the trace will stop when it reaches the right-hand side of the graph. This allows you to examine the screen at your leisure. Press the pause button to continue. In continuous mode, the screen is automatically erased and a new trace starts from the left side of the graph and runs continuously. In scroll mode, the screen scrolls as a new trace goes beyond the right side of the graph and runs continuously until you click on the Pause button or hit the delete key to erase. 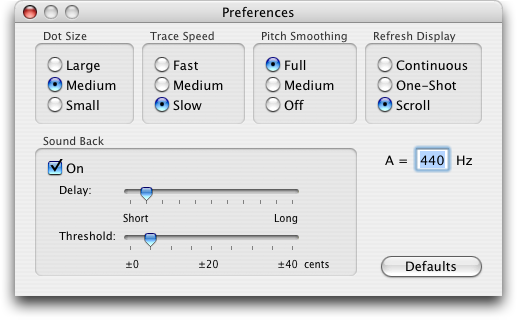 Sound Back automatically generates a reference tone, as an auditory guide. The reference tone selected is the nearest chromatic note. Reference tones are relative to the 'A' reference and are always exactly on pitch with the chromatic scale. 'Delay' specifies the time interval before the reference tone is generated. 'Threshold' specifes an acceptable error between the input and reference tone. For example, if you need the reference pitch only when the input is off by 20 cents or more, set the threshold to 20 cents. Pause - Pause (or restart) the display. In "one-shot" mode, it is necessary to press the pause button to restart the display. Snapshot - Takes a picture of the display graph and places it in the clipboard. 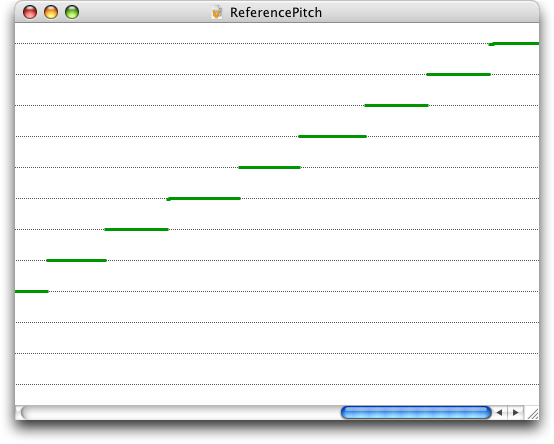 You can open, save, and print the current Vocal Lab pitch graph and the previously saved Vocal Lab pitch graphs. 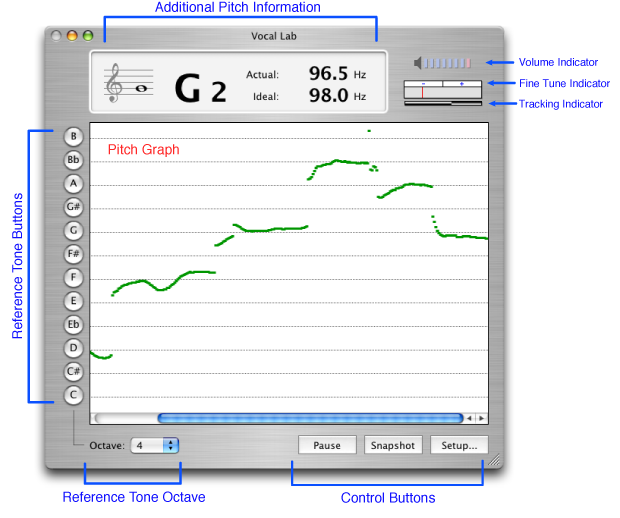 To create a new Vocal Lab pitch graph document, choose the New menu item from the File menu or press command - N. A new Vocal Lab pitch graph document contains a copy of the current Vocal Lab graph from the main window. To open a previously saved Vocal Lab pitch graph document, choose the Open menu item from the File menu or press command - O. To save a Vocal Lab pitch graph document, choose the Save menu item from the File menu or press command - S.
To setup the paper size and the orientation to print, choose the Page Setup menu item from the File menu or press command - shift - P.
To print a Vocal Lab pitch graph document, choose the Print menu item from the File menu or press command - P.